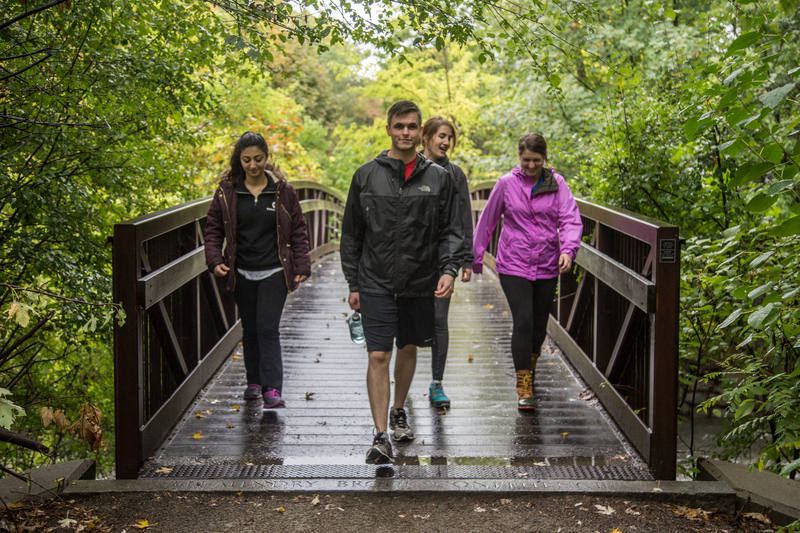 (From left) Diana Atoui, Peter Eberhardt, Jessica Depies and Kelly Tobin cross a bridge along the Charles River Esplanade while walking on the beginning of the Journey for Food Justice. 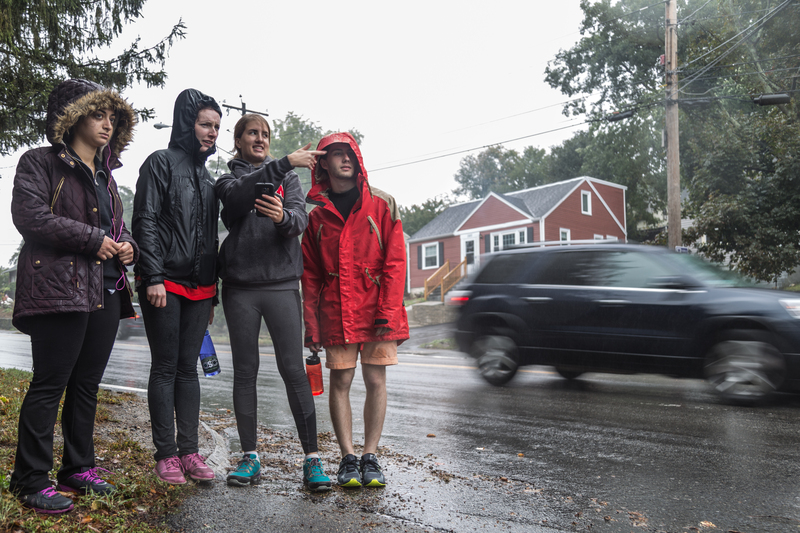 Depies (right) explains the next section of the Journey for Food Justice during the first break near Brighton, Mass. 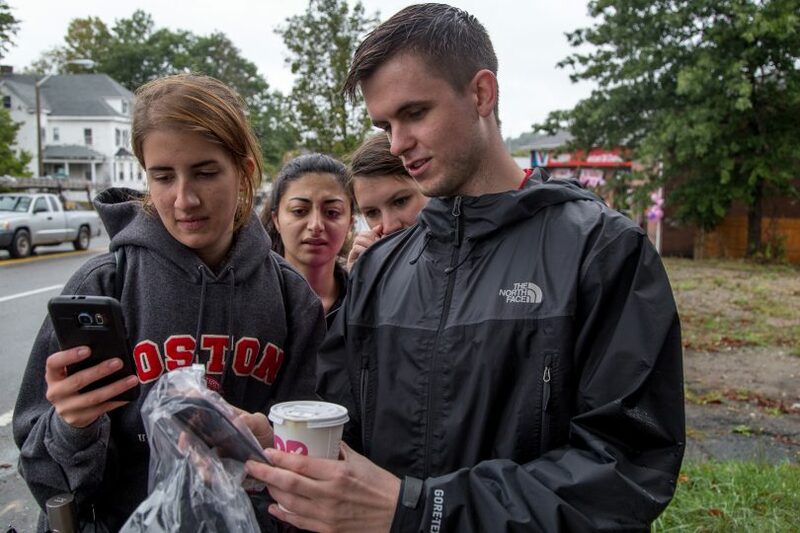 Depies is one of the two Community Events & Education Managers at Boston University’s Community Service Center (CSC). Depies helped plan and recruit volunteers for the walk. 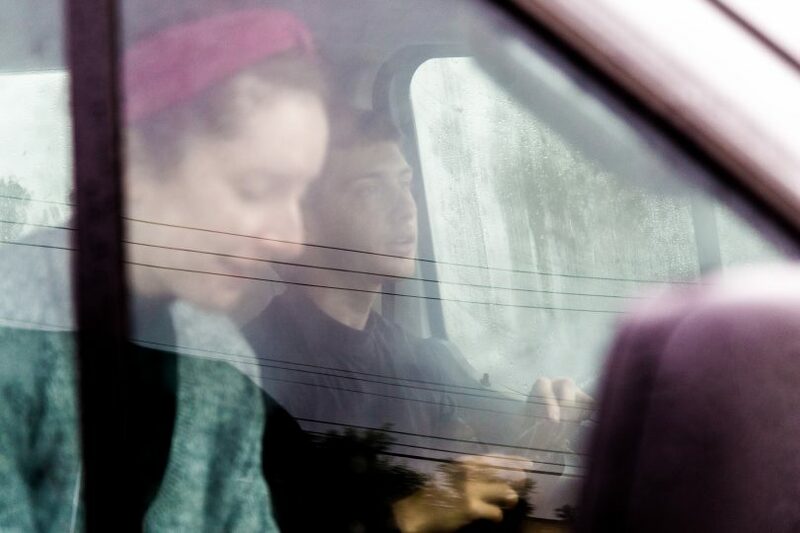 Julian Libin (right) and Amber Walsh begin the second driving shift in thge van provided by the CSC. The van was driven ahead of the walkers meeting them at each checkpoint. Drivers and navigators switched after each section. 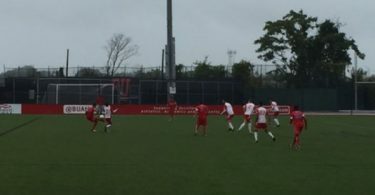 (From left) Depies, Atoui, Tobin and Eberhardt decide which direction to turn at an intersection during the second stretch. The walkers had directions explaining basic directions from one stop to the next but relied largely on cell phones. 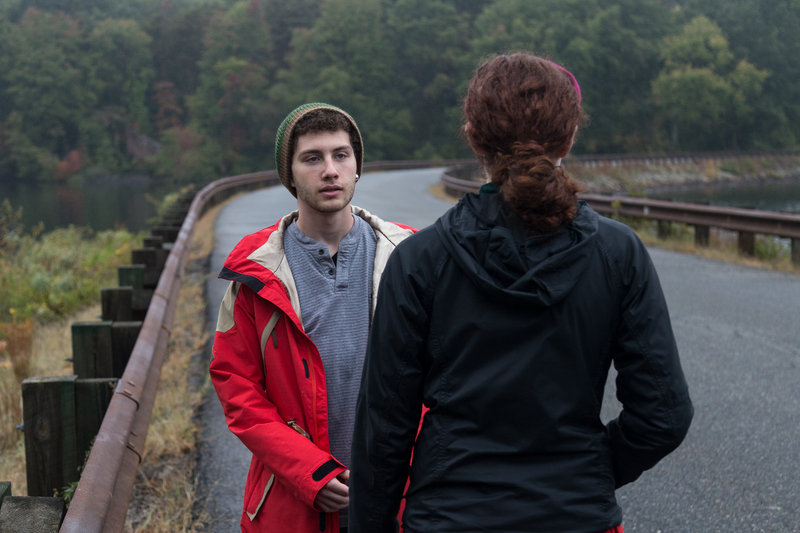 Tobin (front) and Eberhardt take a break on a bridge on the Charles River Reseration. 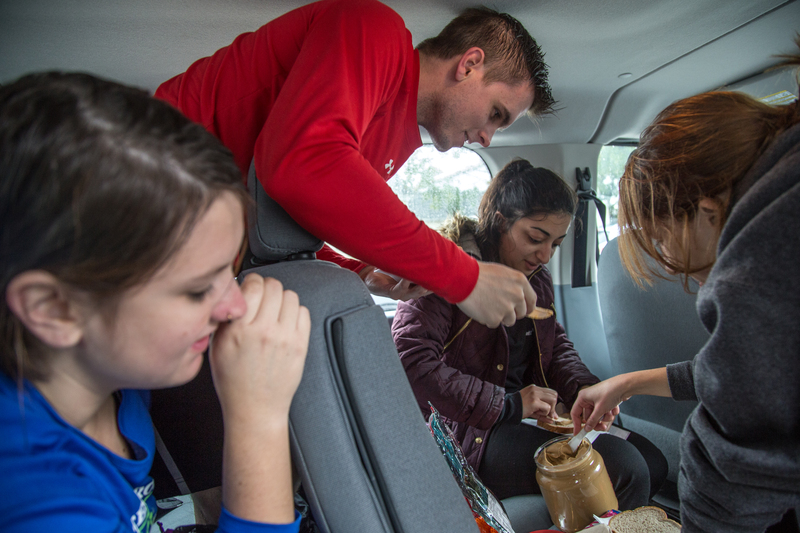 (From left) Tobin, Eberhardt, Atoui and Depies make peanut butter and jelly sandwiches for lunch in the van in Waltham, Mass. 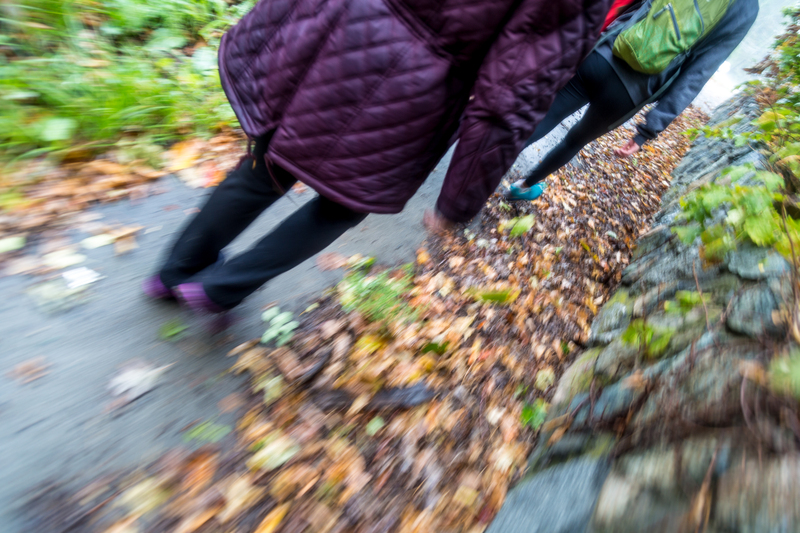 The walkers make their way along a sidewalk lined with fallen leaves on the way to Weston, Mass. 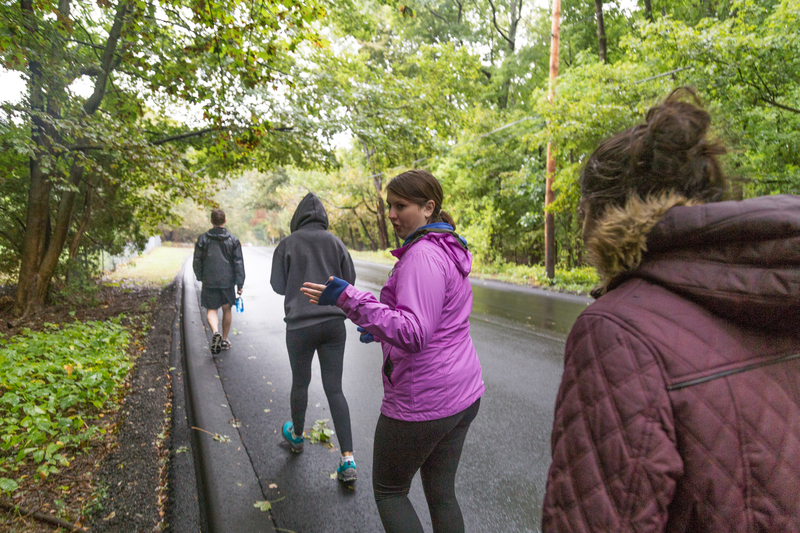 Most of the route had sidewalks, but at times the walkers were forced to walk on the road, on a shoulder or on the grass bordering a road. (From left) Atoui, Walsh, Depies and Libin debate which direction to go. Depies (right) directs the walkers accross a busy highway. Depies (left) takes a photo of Libin as he rests on a log on the last leg of the first day. The walkers spent the night in a church at the end of the first day. Tobin speaks while walking on the second day of the journey. The walkers entertained themselves on long stretches by playing games like “would you rather” and “hot seat” and telling stories. 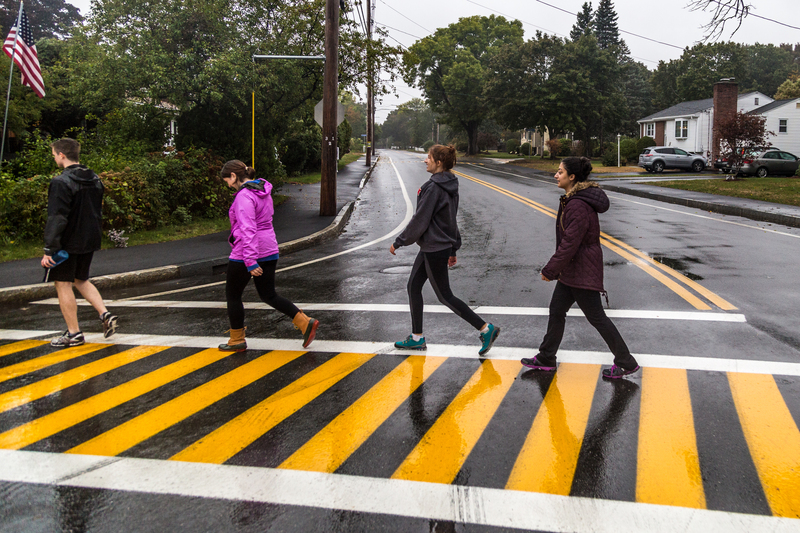 The walkers cross a street in a residential area. Lipin and Walsh discuss wether or not to continue on a highway or be picked up by the van. The last section of the walk was on busy highways with limited sidewalks or room to take breaks. 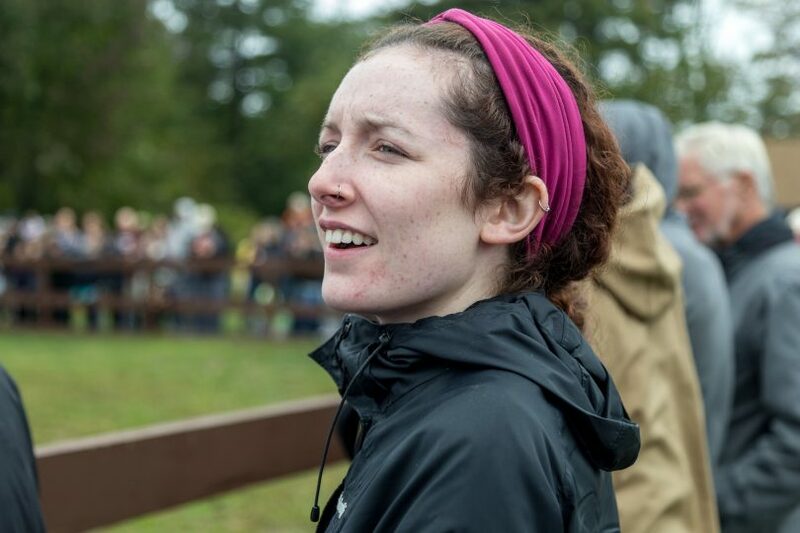 Walsh watches a horse show after the team arrives at Heiffer Farm. 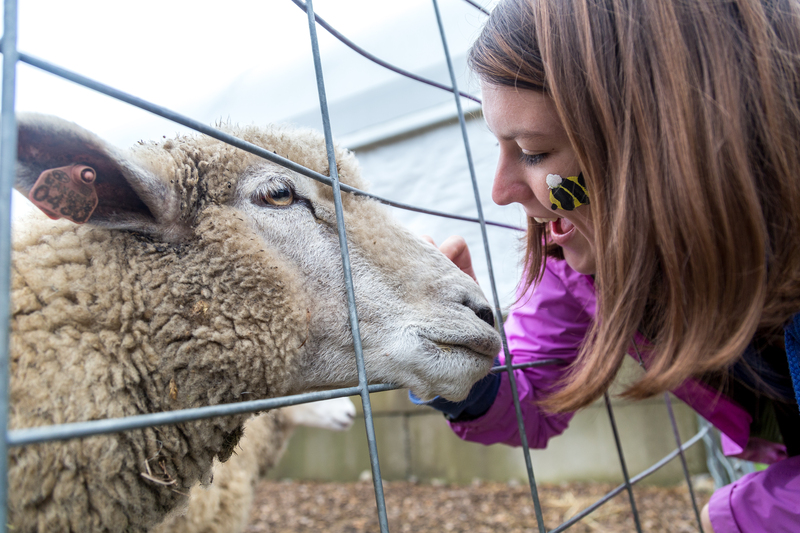 The farm operates as an educational volunteer-based farm that runs programs throughout the year to educate visitors on agriculture and livestock and Heifer International’s work. The walkers, including Walsh (center right) watch a goat milking session along with other visitors of the farm. Tobin reacts to a sheep sticking its head through the fence to be pet. 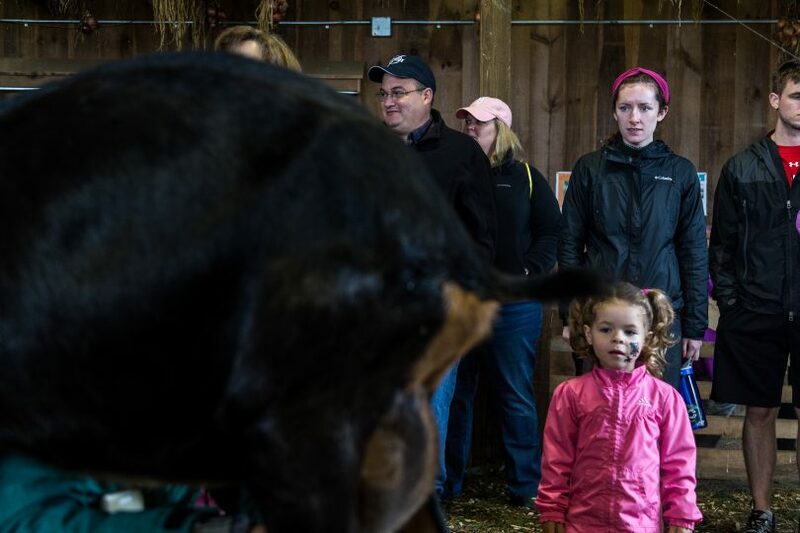 Heifer Farm reflects the organization’s work internationally. It houses cows, sheep, goats, llamas, alpacas, chickens, rabbits and yaks, some of which are the types of animals that Heifer International provides to people in developing countries to help them build a sustainable income. 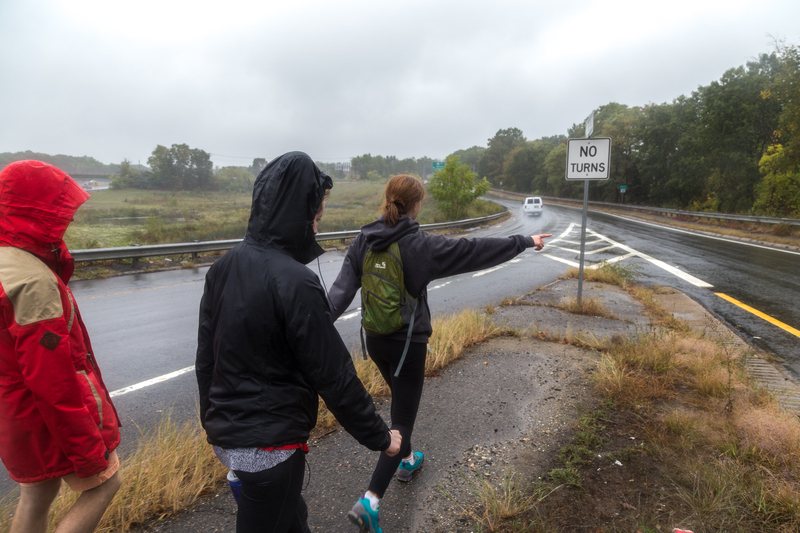 A group of student volunteers walked 27 miles over two days for the 25th annual Journey for Food Justice to raise money for Heifer International. 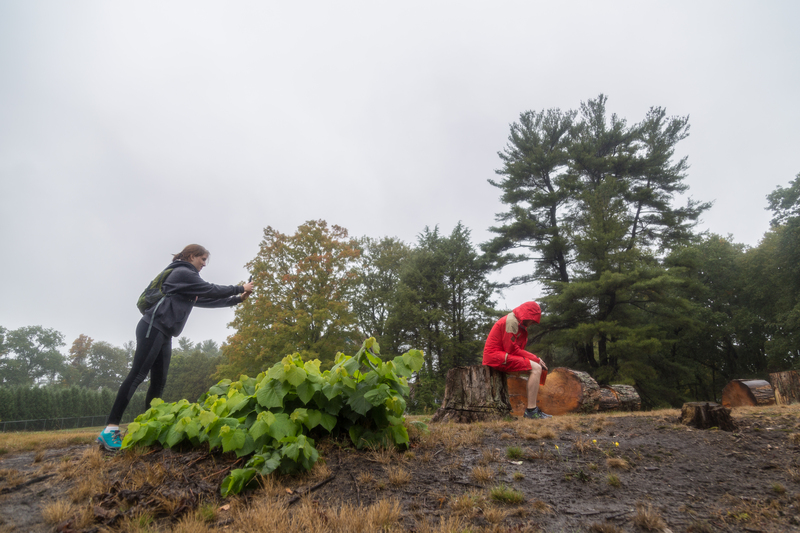 The walk started at Boston University’s Community Service Center (CSC) on October 1 and finished at Heifer Farm in Rutland, Mass., the next day for the International Harvest Festival. 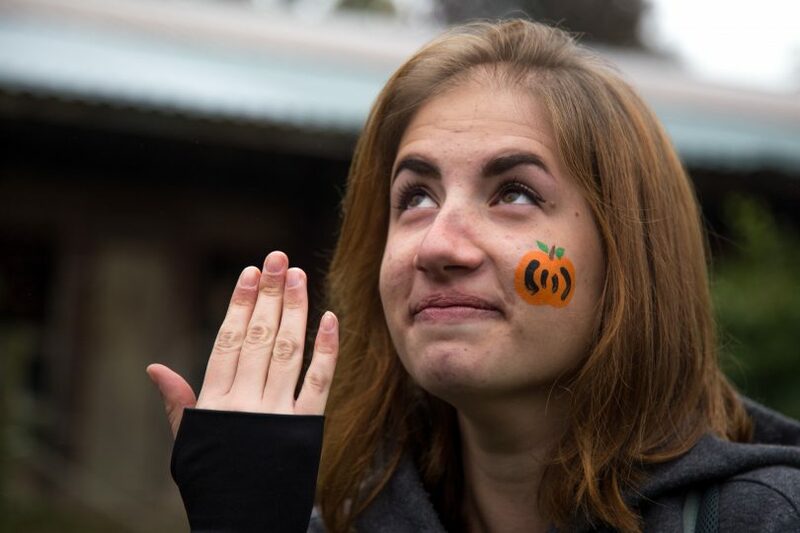 The walkers raised more than $150 so far for Heifer International, a non-profit that provides livestock and resources to people in developing countries. Jessica Depies, community events and education manager at the CSC, said the team will raise more funds after the event.